I spent the last three days camping with friends up on the Arapaho National Forest. 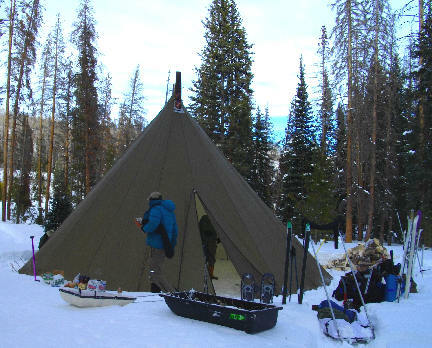 I have done a little deep-winter camping before, but never before on skis with a sled. I learned that my sleeping bag is not really warm enough for -18 F. (-27 C.) nights. Must remedy that. Even after that short time, it is hard to make the transition back to the writing life. And things like Facebook--or even blogging--seem so trivial. But I am developing some new blog posts, so check back after a couple of days. Impressive. I've never camped out below -8 C.